For the opening of the tournament, we had a western theme party. 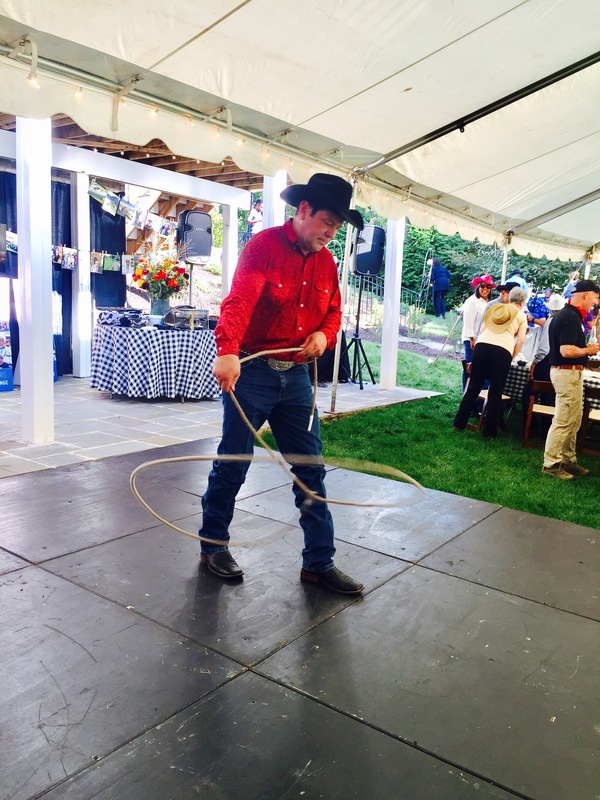 I performed some great trick roping stunts but for the Nuns and Doctors who sponsored the event. We also had line dancing for them and I tought the Nuns to line dance and trick rope. We even had a Dummy horse the guest sit on and roped a dummy calf. But the guest lived to line dance and I was happy to teach them the electric slide. I want to thank Dr. Ross, Dr. Shack, Dr. Hanna and the Bon Secours Nuns who took the stage with me to show off their trick roping skills. We had a chuck wagon feed with the best BBQ in the state. The event raised over $300,000. I also want to thank all the players, Doctors and all the volunteers. It was my pleasure to be a part Bon Secours. My handicap is, well I won’t say but if you want to look good come to play around with me. It took all morning to sign in, but the weather is perfect! There were so many players that the golf carts numbered into hundreds. I looked up one line and seen them number up to 380.